Interview with the Piedmontese collectionst who created an Archive to protect and promote Carol Rama’s work. Passion, ownership, decoration, safekeeping and promotion: these are the first impulses which push an amateur like our Piedmontese collectionist, to put together a marvellous assemblance of art works. An assemblance, yes; not a collection, because, as suggested by Lea Vergine, a collection would imply a precise vein to be followed, while our collectionist is fond of all types of art: from decorative art to the commode of the eighteenth century , from contemporary art works of Ruggero, Griffa, Calandri, Castellani and Fontana to designed furniture of Eames and Oppenheim. His choices are heterogeneous and uniquely dictated by his passion, even if contemporary art is favored in respect to the ancient one, which makes more problems in preserving and in positioning, as he himself is aware of. A masterpiece of this collection is constituted by the works of Carol Rama, known artist of Turin panorama of the second half of the twentieth century and great friend of the Piedmontese collector. Through the years the latter has been her greatest patron and sponsor, and has gathered over the years the largest number of Rama’s works available on the market. With the continuous growth of the collection, that was started in the Fifties, the need for an Archive and a rigorous scientific documentation of the art works have spurred our collector to realize a network of the art works and then also in paper for his personal use. In both these databases the art works are registered thoroughly and have also photos reproductions, if not sometimes photos given by the artists’ archives themselves. For protection but mostly for promotion and exposure of Carol Rama’s art works our collector has opened an internet site detailed and opened to the general public, where, all the art works that he possesses are exposed, catalogued and equipped with a short introduction to the life and poetics of the artist. His interest is not purely for the protection of loved works of art but, also, a desire of sharing his passion with the public, that is fulfilled by the works of art being exhibited in various museums. 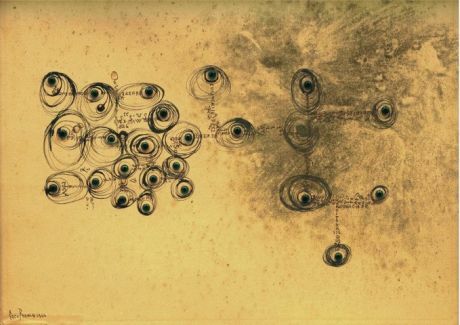 For example, the Fondazione Art Museo di Villa Ponti at Arona , in 2006 exposed all the art works of Carol Rama, collected by our Piedmontese collector and soon after exhibited other works of Carol Rama. 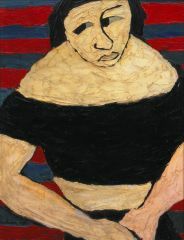 These works have then being exposed as well at Fondazione Sandretto Re Rebaudengo of Turin, to MART of Rovereto and to the Contemporary art museums of Amsterdam, Paris and Newcastle. The Piedmontese collector’s greatest fear is that the works in the future might be dispersed, and so he tries to make a stand by researching a site, not necessarily in Italy, where there is willingness and interest in keeping these works of art, hoping that the love that a collector – that binds himself to its collection – is renovated day by day.